Quincy joined Arsenal as a scholar from Ajax, where Dennis Bergkamp and Kanu plied their trade. The Dutch Under-21 star spent nine years at the Dutch club before he joined The Gunners in September 2002 and made 23 full appearances for the club. Quincy (ÊÂÈÍÑÈ) has joined Spartak Moscow for an undisclosed fee in January 2006. He is the first Dutch player joining the Russian league. It is said he has signed for three years. With minimal playing opportunities, he decided to go on a loan transfer to Spanish club Celta de Vigo until June 2008. He returned to Russia in June 2008 and his club decided to extend his contract until December 2010. In August 2008 Birmingham City have signed Quincy on an initial loan deal until January 2009 with a view to then extending it until the end of the season. The option to extend was not used. He made 13 appearances and 3 goals for the Blues before returning to Russia. At the end of January it was confirmed that Welsh club Cardiff City have signed Quincy on a loan deal until the end of the season 2008-09. He returned to Moscow at the end of his loan-period. 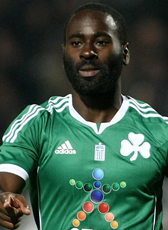 In January 2010, struggling English side Portsmouth have signed Quincy Owusu-Abeyie from Spartak Moscow on loan until the end of the season 2009-10. However in April 2010 his loan spell was cancelled. The winger has joined Qatar side Al Sadd on a 3-year deal, after they agreed a fee with the Russian club. Quincy made 11 appearances for Pompey after arriving in January 2010. At the end of August 2010, he rejoined the Spanish league on a season loan deal at Malaga CF for the 2010-11 season. For the 2011-12 season he went on another loan deal. Greek club Panathinaikos signed the striker for 0.5M€. His successful stay in Athens was continued. In August 2012 signed the forward a 3-year contract until 2015. Panathinaikos bought the player from Al Sadd. In December 2013, he was released from his contract. In August 2014 he found himself a new club in Portugal and signed for Boavista. Quincy was released from his contract in February 2015. Until the summer of 2016 Quincy was without a club before he signed a one-year contract at NEC in July 2016. In January 2017 his contract was terminated. Although playing as a Holland U21 player, Quincy decided to play for the national team of Ghana, the country of his parents. His first appearances were for Ghana in the Africa Cup in the beginning of 2008.